What's my network's status ? If I am lucky, I work in a company that encourages me to share my network information with my coworkers, so we can use the combined power of our relationships to work more efficiently and quickly with outside contacts. It’s also good to know, and some of you may have the tool to help you visualize and share this information, how my network overlaps with my client’s network. In other words, how many of the people in my client’s ecosystem are in contact with the people from my company. When working in an o2o sales environment (see our post There is B2B, I2I and O2O. Here’s how to understand the terms and the concepts. (2018-01-16)) having this kind of insight is essential. In the table here, the people in green are part of my company and the people in blue make up the client’s company. I admit, it’s neither a big or complex ecosystem, but I think you’ll get the point. The crosses show who knows who. It’s as simple as that. The ability to assess your network coverage as it evolves is important for two reasons. I can see that Karen knows a lot of people in that account. This makes sense as she’s the KAM. Esther is new to the team, so she doesn’t yet have contacts here. This kind of insight can help me to plan and organize my team to prepare for situations like maternity leave, retirements, people moving on to another job, etc. If Karen informs me tomorrow that she is pregnant, I can I react quickly to work out how best to fill the holes in my network coverage in time for a smooth handover. 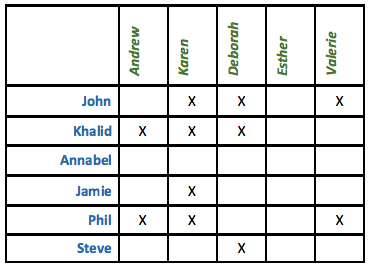 Using my chart it looks like Deborah is currently best placed, although she would need to build up relationships with Jamie and Phil. Alternatively, I could chose to bring new blood and fresh eyes to the account, and decide to get Esther involved. This all depends on the real business case and my motivations behind decisions. And, when Karen comes back to work, I can look at my network coverage again to work out what to do for the best. As the concept of a job for life is evaporating, being able to do this kind of analysis quickly and simply is becoming more and more important. Looking at my simplified network coverage, I can see that Annabel isn’t in contact with anyone from my team. Depending on who Annabel is, this may or may not be important. Given that she is part of my client’s ecosystem, I should at the very least identify her and her role. And then, depending on my business objectives and the role that Annabel plays, assign the job of getting in touch with her to someone in my team. While the sample table above could easily be presented in an excel sheet, the problem is to keep the information up to date with other aspects of my relationship intelligence. And herein lies the challenges. You should not be surprised if your CRM systems cannot provide you with this functionality. Even plug ins that can augment CRM functionalities are rare to find. I actually know of only one. Do not hesitate to contact us if you want to know more. Older PostAlways differentiate between the position and the person holding it !